Education leaders throughout the Minnesota are looking again at school safety and security procedures after the shooting deaths of eight people at Red Lake High School. Monday's attack was the second fatal shooting in a Minnesota school in 18 months. 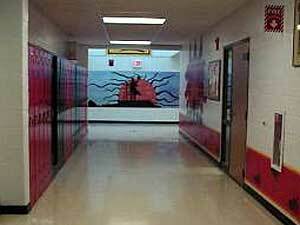 Two students were killed at Rocori High School in Cold Spring in September 2003. State law demands every school district have plans for preventing, responding to and recovering from such tragedies. St. Paul, Minn. — Red Lake High School is located inside the boundary of the Red Lake Indian Reservation, which is a sovereign nation. But it's also part a Minnesota public school district and subject to all state education laws. One of those laws requires a local plan for addressing potential violent incidents. Education Commissioner Alice Seagren says school officials in Red Lake had a crisis management plan and appeared to use it. "They did lock down. They did sequester children and move kids to the places where they deemed the safest in incidents like this," Seagren says. "So, I think they followed through as much as they could. Like any situation like this, it took them a while to even realize what was going on." In total, the shootings at Red Lake claimed 10 lives, including eight at the school. That makes it the nation's worst school shooting since 1999, when 15 died at Columbine High School in Colorado. Columbine prompted tighter school security measures throughout the country. In Minnesota, lawmakers ordered all school districts to work with local law enforcement agencies on emergency plans. Bob Lowe of the Minnesota School Boards Association says the step-by-step instructions cover all kinds of disasters -- everything from a fire to a terrorist attack. He says those plans are no longer sitting on a shelf. The only way to go to another level of protection is to turn them into closed, almost prison like institutions. "I would guess that virtually every superintendent in the state of Minnesota has pulled that policy down to make certain that what they have in place is up to date, will work. And is probably planning right now with their principals to go over various exercises and programs with staff and students, in the event that they have to deal with something tragic such as this," Lowe says. Many school districts also stage mock disasters and evacuations to test their emergency plans. The drills are sometimes elaborate productions. Public Safety Commissioner Michael Campion says schools cannot practice too often. "That's a delicate balance between not alarming parents and students, yet having school officials be prepared to respond to whatever incident might take place," Campion says. Campion says the Red Lake shootings have made law enforcement and school district officials throughout the state more vigilant. A high profile crime can sometimes inspire similar acts. The Red Lake incident shows that despite extensive planning, schools remain vulnerable. Gov. Tim Pawlenty says he wants to prevent as much as possible a repeat of Red Lake. "From the press accounts, it looks like the school had very rigorous security procedures in place, including cameras, metal detectors and security guards," Pawlenty says. "What it probably says, at the end of the day, is if you have a deeply disturbed individual who is intent on doing damage, they probably have a pretty good chance of succeeding." The state mandates crisis plans, but not security equipment. Few school districts in Minnesota have installed cameras or metal detectors. Armed security is also rare. Charlie Kyte of the Minnesota Association of School Administrators says public schools have always been viewed as active, open buildings. "The only way to go to another level of protection is to turn them into closed, almost prison-like institutions," Kyte says. "I'm not sure that we want to close that movement down in every school in the state. I hope we never get to that point. But this tragedy forces us to rethink that." Minnesota Department of Education officials say they're offering grief counseling and other resources to help the Red Lake school district recover from the shootings. They've also posted information on their Web site to help all parents, teachers and students talk about the tragic events.